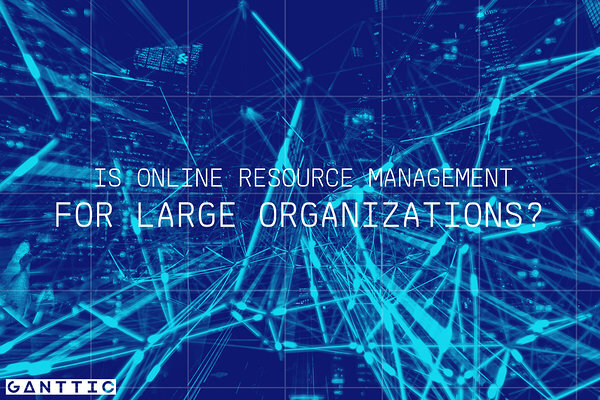 Is Online Resource Management for Large Organizations? There are many resource management tools out there for smaller organizations. The tools usually work the best if you need to keep track of the capacity of about 10-20 people and if you need to plan daily or weekly tasks. The tools are meant for scheduling that is granulated and precise. Often, the employees log their own work and the project manager just schedules the initial higher level tasks. There are commenting or reacting options for others accomplishments or struggles, and maybe even a work methodology like OKRs built in the software. Features that are definitely nice to have but often are – for a large organization – just clutter. When scheduling hundreds or maybe thousands of resources, it’s not about the cutesy stuff that's great for team building and collaboration in that more detailed sense. It’s about knowing what’s coming and collaborating on creating the schedule. And you need the picture to be clear and the software easy to use, so there wouldn’t be a steep learning curve for all of the resources that need to log in and check their schedule. These problems create a unique need for a product that is scalable, accessible, and easy to use. While scalable tends to indicate to on-premise software, both accessible and easy to use tell you to opt for a cloud-based solution since these tools are constantly improved and can be accessed from any device without downloading the software first. Two for one seems like an easy decision, but it never is when choosing a collaboration software. Even more so for large organizations. Many still choose on-premise solutions since there aren’t many cloud-based services that cater to their needs and because on-premise solutions have always been in the source code of large enterprises. But do they really have to be? Or could online resource management be for large organizations? Since we have been providing planning software for almost 10 years now, we have learned about every single pain and advantage there is. And while there are reasons why large organizations should choose an on-premise solution, there are also great counterpoints. The thing with online resource management tools is that often, you can’t decide much. You can add a label to your data field, but can’t decide what kind of data you can add. You can choose between templates, but what you can create on your own is limited. When something goes wrong, you can’t call your own IT department, you have to put your trust in some other company. And last but not least, you can’t choose the weapons to protect yourself with. An in house planning solution can sound like a dream since you can build it from the ground up. You can choose all the features you need to make your planning process as comfortable as possible, and change anything whenever you need it to be changed. When in reality, it’s never that easy and your IT department isn’t there just to work on the planning solution. There are other projects and if the planning tool works, it can stay unchanged as something that can be described as a hopeful monstrosity. When looking towards the most popular online resource management software, you see tools that you should try to fit your data in rather than making it fit your data. Too many features for detailed planning and not enough for making a clear and visual high-level resource management plan. And when you get to thinking about the security of cloud-based services - goosebumps. And not the good kind. Unfortunately, security will always be a question when talking about cloud-based services. Often simply because you want to make sure you are doing the best possible job on keeping any kind of data safe. And it can be difficult to trust someone else with that task. If you do find an online resource planning tool that is customizable enough to actually fit your needs, try to find out how good their customer service is. Many listing sites like Capterra, ask customers to rate the customer service. Read through some of the reviews. Send out an email or two during the trial. Let them guide you. Ask for a demo. Get a taste of it. Then, you’ll know how they'll act when the times are though. And one thing you should definitely ask about in those emails is their servers and how they are going to make sure your data is safe. You don’t have to guess or hope. Transparency is a huge factor in successful resource management. Unfortunately, transparency usually comes with a price. Literally and figuratively. Usually, when adding more users to an online resource management software, the price goes up. So you have to make adjustments. Not everyone needs to see how the work is laid out, right? Well, both studies and real-life experience have shown that involving employees in the resource management process makes them more engaged. Luckily, there are resource management tools out there (cough, Ganttic cough), that price their software per resource in use (so in addition to people also machinery, vehicles, etc) and not per user. The figurative price you have to pay is the time that is needed for training and all the mistakes that are going to be made once everyone has access to the master plan. Here, you should opt for tools that have easy basics. Meaning that while setting the plan up can be a tricky task that can be accomplished with the help of a support team and a helpdesk, it’s still fairly easy to understand what has been planned and it’s also easy to add or edit tasks. You can test it out with inviting a few of your colleagues to try the software out without telling them what your goal is. We have said it before and we will say it again: resource management is never 'do it once and it’s done' kind of job. You have to update the schedule and reallocate resources on a daily basis. Online tools are great for that. Even more so when considering flexible working hours when everything is done on the go. You can’t hope that whenever someone notifies you of an expected change in the schedule, you will be behind your trusty office PC every time. Or that everyone else that’s supposed to check their schedule is, too. So make sure there are integration options for more widely used calendar applications like Google Calendar or Outlook. Going further with the last point, you need the updating process to be fast and easy. You know those email threads when someone notices a booking in the schedule that wasn’t there yesterday but is there now and what’s also there is a double booking? Yeah. These things tend to happen when updates aren’t instant, more than one people are doing the booking, and projects are using the same resource pool. Live updates keep your mailbox clean and uncluttered and make your job a little bit easier. Resource Management Tools - A Relief To Time Pressure?